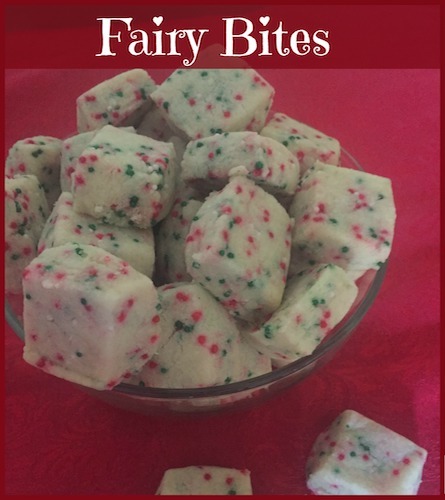 Fairy Bites: Shortbread Recipe in Miniature! Fairy Bites: they’re tiny shortbread cookies that are just TOO adorable. You make them like a traditional shortbread using the usual butter, sugar, flour and flavoring – but with two twists. The first is the addition of nonpareils, those itsy-bitsy cookie decorations that are actually teeny balls of colored sugar (see more on nonpareils.) You mix them into the dough. And you can use colored nonpareils to fit the occasion – say, red and green for Christmas shortbread cookies or red, pink, and white for Valentine Fairy Bites. And second is this: you cut the dough into bite-sized pieces before baking. Then you set the bites on the baking pan with a bit of space in between each one. Voila! You’ve got perfect little confections for a tea party or favors or for a holiday cookie tray. They’ll make you smile! Line an 8 x 8 or 9 x 9-inch baking pan with plastic wrap. Leave a 1-inch overhang. Set out baking sheets, but leave them ungreased. Place butter, sugar, and extract in a medium mixing bowl. Using an electric mixer on medium speed combine the ingredients, scraping the bowl often, until the mixture is creamy. Reduce speed to low. Add flour and salt until dough is well mixed. 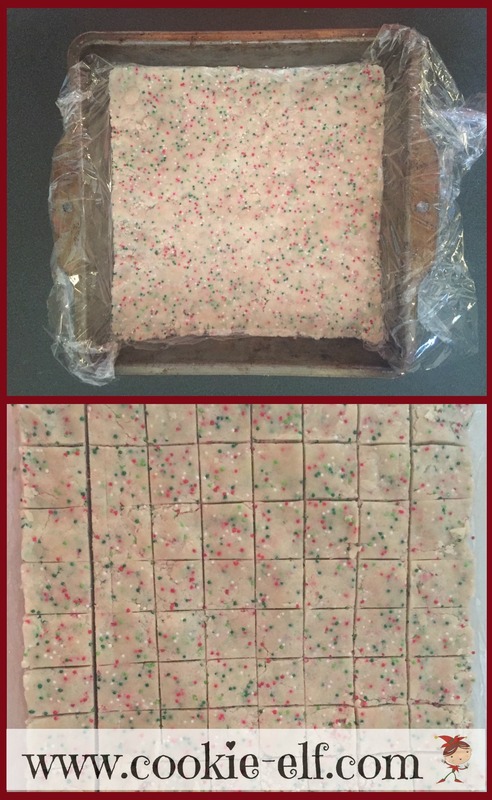 Stir in nonpareils. Knead the cookie dough 4-5 times in the bowl until it forms a ball. If the mixture does not form a ball quickly, then it is too dry. Add 1-2 additional tablespoons of softened butter and try again. Press the cookie dough evenly into the baking pan. Use a block box of butter or margarine to smooth and even out the shortbread surface. Use the overhang to lift the cookie dough from the pan. Place the bars on a cutting board surface. Cut the dough into ½-inch squares. You can trim uneven edges if you wish. Gently place the tiny squares on the ungreased baking sheets, ½-inch apart, using a small spatula or an icing knife. Bake shortbread for 15 minutes or until the bottoms begin to brown. Remove the pan from the oven. Choose either almond or vanilla extract, according to your taste. Adapt Fairy Bites to fit any event or celebration. Simply choose nonpareils and sprinkle colors to match the theme of the event or holiday. See more types of shortbread on our Shortbread Pinterest board. Funfetti Sugar Cookies: great for kids!